It had been a long held dream of mine to hike in the European alps. Perhaps having spent a lot of my childhood listening to Heidi (a story about a girl who goes and lives in the Swiss alps with her grandfather) on cassette tape (yeah i am that old), or just my inherent love of mountains, but I have had a long held fascination with hiking the alps. In my 20’s I’d bought books and read about several long distance hikes, and even once did a short hike in the German alps with my sister and some friends. Now that we lived in London it seemed time to fulfil another long held dream of a long distance walk through the alps. It wasn’t exactly hard to convince Astrid that a walking holiday surrounded by mountains and wilderness would be a good thing. 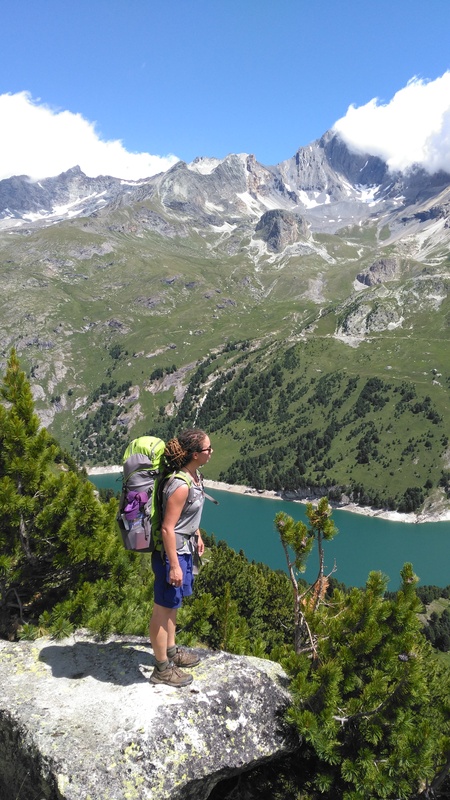 Our friends Chris and Pete have done many hiking holidays and it was with their help that we finally decided on the Vanoise National Park in France. I wanted to write this blog partly to share the amazing photos and inspire anyone thinking of a hike in the alps, but also because we did it on the cheap. 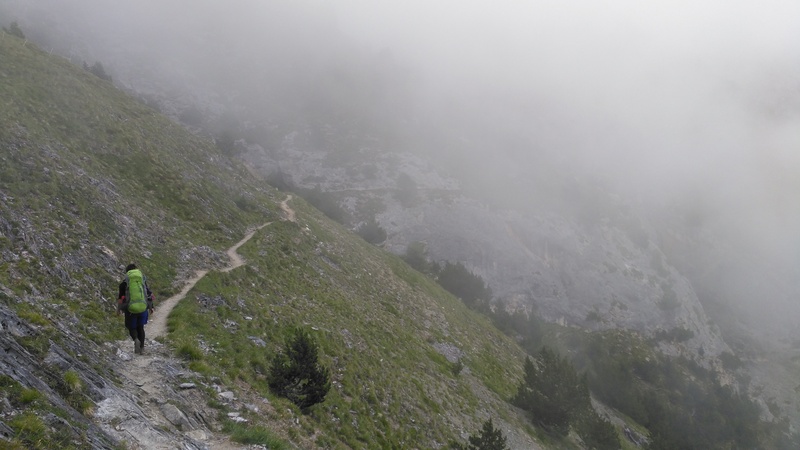 Weirdly enough, hiking in the alps could, if you let it, cost you a lot of money. If we had done it how many of the French do it, I am not sure we could have afforded it. The good news is that you can actually do it on quite a small budget. To save money there are three things you need to do; camp wherever possible, carry all your own food and not drink alcohol. We did the first two but decided a cheeky wine at the end of the day would be our treat. Not exactly unpredictable for us! We could’t resist the French wine! In a lot of European National Parks you can only camp in allocated areas, or not at all. In the Vanoise National Park you can only camp at huts that allow camping. Luckily most huts on the tour of the Vanoise do allow camping. A lot of people will stay in the huts which cost around 45 euros per night – this usually includes breakfast (but not dinner which will set you back around a further 25 Euros). Some even have a vegetarian surcharge! Being vegan I imagine would be near impossible. I know many huts helicopter in their food, or walk it in (although some huts are near roads and still charge the same as the more remote ones). I can’t help feeling that at least some of the prices are charged just because they can. By eliminating the hut sleeping fees and meal costs we spent significantly less. Most huts have kitchens which you can use for around 2 euros and for those that don’t, we just carried our trusty stove anyway. On a tour of the Vanoise self catering is totally possible. You do have to carry enough food for the first 6 days, but after that resupply is much easier. We paid to sleep in the hut on only two occasions. The cost to camp at the huts is around 5 euros per person and includes use of the toilets and showers. It is probably possible to wild camp (although inside the park it’s illegal), especially outside the park, but on this occasion we opted not to. In the beginning there was a night bus. Luckily, this time we had both packed sober and were well prepared. We reached St Pancras with enough time to easily get through security and partake in our usual pre train beer. Never mind that it was ludicrously early. The first Eurostar of the day was soon speeding through the green English countryside before popping under the channel and into northern France where it was raining. An hour or so later were were in Paris. From Gard De Nord we took the RER 3 stops to Gare De Lyon, pushed our way through the crowds and found our train heading south. The dreary plains of northern France with their grey skies and depressing monocultures gradually gave way to vineyards, mountains and blue skies. Several hours later when we reached Modane at the trail head, it was hot and sunny. I was shattered from the early morning but the excitement of arriving livened me up. We were now in the Maurienne valley and mountains surrounded us. Although we had been super organised and already bought all our food for the first 6 days (not actually necessary as Modane has a big supermarket), we did not have fuel. Unfortunately even the Eurostar does not allow petrol on board. I had googled the french equivalent of white gas and kerosene and had come up with a few options. However, none of these had been available in the supermarkets I had quickly checked. I was a little anxious. We did not yet know that most huts would allow us to use their kitchens and I was imagining two weeks worth of cold meals and more importantly, no cups of tea. The thought was depressing and alarming. Luckily Modane has an unmanned petrol station which allowed us to fill our 1 litre fuel bottle (it can sometimes be tricky due to it being so small and petrol station attendants getting angry). Now we were ready to hike. We followed the signs pointing out of the town and into the promising wilderness. Soon the path became unforgivingly steep and we sweated and puffed in the warm evening air. Higher and higher we climbed, through pine forest with the occasional glimpses into the valley below and the mountains towering above. Eventually we broke out into an alpine meadow and were finally granted the stunning vistas the trees had been obscuring. I had one of those perfect moments were everything comes together. The views were just beautiful, I felt amazing, I was with Astrid and we were finally in the alps, hiking. Not long after that, just as the light was starting to fade we reached the first hut, Refuge de l’Aiguille Doran. Everyone else was inside eating already and we could see the relief on the Guardien’s face when we only wanted a beer and a place to put our tent. We cooked our pasta and drank a cold beer over looking the mountains. It was crazy to think that morning we had woken up in London and now we were here, surrounded by all this beauty. The morning dawned misty and the previous day’s epic travel had taken it’s toll. It took me an hour to pull myself out of the tent. Finally, we ate breakfast, packed up and headed back into the forest. As we hiked upwards, the clouds swirled around and it was quite cold. However, I felt it was only a matter of time before the high summer sun would triumph. Mornings in the mountains we would learn would often start misty and cold, until the sun burnt away the clouds. On reaching an alpine meadow, dotted with huts we were afforded views of rocky crags and even the refuge we were heading to. We snacked and headed up the valley, passed clear creeks and over rocks. It was so beautiful. At one point there were two shining blue dams below us and like predicted the sun came out and our layers came off. It wasn’t long before we reached refuge Plan de Sec. The guardien showed us somewhere to put our tent and we settled in for an afternoon of yoga, writing and reading. It was nice to get somewhere early. More and more people arrived and we realised that it was in fact a French public holiday. Even though we were surrounded by others, Astrid and I were clearly the only foreigners and as our french was minimal at best we didn’t really get to chat to anyone. From refuge Plan de Sec we were headed to refuge L’Arpont, along with many french families and groups. It was the only time things became a little crowded in the park. We didn’t really care, it was still nothing like walking the Camino. The first part of the day took us through alpine meadows, some which had temporary fencing for cows. We were learning that even here, in the high alps, people eked out a living from agriculture. It was often a topic of conversation as it was clear how destructive the cows were on the environment. Yet, at the same time it was such a tradition, people had been using the high summer pastures of the alps for centuries. However, tradition doesn’t necessarily make something inherently good. Then again, perhaps there is room for small scale, sustainable agriculture? Is agriculture ever sustainable though? And while the cows looked peaceful (and are no doubt better off than many) we don’t get to see when their babies get torn away from them so that humans can drink their milk and turn it into cheese. While there may be times in the future when out of necessity I’ll eat cheese or drink milk, I can’t really get along with the exploitation of animals for human consumption, no matter how picturesque. While our topic of conversation may at times have been heavy, our mood was light. We soon left the meadows behind and walked into a much wilder valley with craggy snow capped peaks, steep drops, pine forests and sweeping views. It was everything I’d hoped hiking in the alps would be. We spotted wild flowers, marmots and even an ibex! After dumping our packs by refuge L’Arpont we walked up to the glacial lake and sat in the afternoon sun, enjoying the beauty that surrounded us. We woke to clear blue skies and bright sunshine. I managed to buy a coffee from the cafe at the hut and savoured the views and the sun while drinking it. A perfect start to the day. Our walk took us further into the valley again and we were surrounded by high peaks and glaciers. Every vista was more amazing than the next. In the late morning we came to a spot where our book said you could climb up to a tarn fed by waterfalls. We had time and were feeling adventurous and strong and decided we needed to explore further. There was no visible path so we just walked towards some imposing rocks where we thought the path should be. After quite a bit of searching, we spotted something that might have been a track and began our climb upwards. It was tough going and took us around an hour, scrambling over large boulders and jumping over small creeks. When we eventually made it up to the tarn it was well worth the effort. No one else was up there and we surrounded by the epic beauty of rocks, ice water and the brilliant blue of the sky. It was so peaceful. We got undressed and dipped into the icy water, then lay naked on the rocks in the sun. Life was perfect. Once we hiked back down we at lunch by a small tarn and then hiked the rest of the way to refuge plan de lac in the hot afternoon sun. Unfortunately this was one of the only huts that didn’t allow camping, so we checked into a dorm and then went and sat on the balcony enjoying a cold beer as the heat faded out of the day. A wonderful end to a spectacular day in the mountains. I slept badly in the hut but luckily we had made a friend the night before – a French Canadian lady called Francoise who provided me with instant coffee to keep going. We set off fairly early but it wasn’t long before the heat of the day was upon us. Our day took us through more alpine meadows and then an ascent with views of the ever present high peaks. Later we descended into a beautiful pine forest, which reminded me of my childhood Christmas fantasies. We had lunch at an unmanned refuge before heading along a very exposed track before finally descending into a valley, dotted with cows and refuge Vallobrun. The guardien at this refuge treated us very kindly and gifted us left over blueberry tart. We rose early like normal, cooked a simple breakfast of porridge, washed down with tea and headed off. Our morning took us towards the valley floor, through pine forest, the air growing warmer the lower we got. The first village we reached was Bessants where we restocked at the supermarket and then ate a lunch of baguette in the village square. Our afternoons walk took us along the river, it was hot and no one was around. After a short discussion we dumped our packs, stripped off and jumped into the cool clear water. It was wonderful. Everything was so lush, green and alive. Insects buzzed continuously, the sky was this immense blue and I felt physically strong and the happiest I’d been in a while. I’m not unhappy in London by any stretch of the imagination, but coming out here and being in nature reminds me of where my soul really belongs. We managed to pull our clothes on just before a French family came walking along the path. Swim completed, we continued along the valley, the walking was easy and so very pleasant. In the afternoon we reached the medieval village of Bonneval Sur Arc which was a cluster of beautiful houses made of stone and wood, with small doorways and narrow staircases. There are very fews signs of the modern world in this village – no cars, cables or tv antennas. We had reserved the cheapest, tiniest room in Aubergue d’ Oul which was a bit like stepping back in time. I suspect our tiny room was once a cupboard though! Not that we cared in the slightest. After a bit of a rest we explored the village before an evening thunderstorm rolled in. While it rained we rebelliously cooked our pasta on the balcony and drank a cheap bottle of wine. Armed with baguette’s we spent the next morning reclaiming the height we had lost. The track out of the village was incredibly steep and I took a wrong turn at one point, resulting in a crazy scramble up a very steep slope. Once the initial mad ascent was over we steadily gained height all morning. Walking through meadows, passed streams and huts, meeting other hikers as we went. A few times we took breaks to munch on baguette, it was hot and sunny and sweat dripped off both us. I felt so wonderful and full of energy, despite the steep going. The mountains got closer and closer and after some hours of walking up the valley we were back amongst them. Taking a turn after several hours we found ourselves walking through a rocky, glacial landscape. The weather changed and we were briefly blasted by wind and rain. I love the crazy unpredictability of mountain weather; Soon the sun was out again, although on the horizon we could see dark and heavy clouds. It was the afternoon now, and after climbing all morning we had gained quite some altitude. The landscape was dramatic, sheer rocks and icy lakes; only the toughest of alpine flowers and vegetation surviving. It was a stark contrast to the lush and green valley, literally buzzing with life that we had walked through earlier in the day. After some more steady walking we reached the Col – pass. The views were spectacular. High up on the pass the weather looked like it was turning and we quickly began descending. Soon it appeared that the storm was chasing us. We began to run, hoping to make it to the hut before the summer thunderstorm hit. Lighting began to strike across the valley and thunder cracked right above us. It was amazing to feel the power of nature in such dramatic surroundings. Descending off the col we had a good view of everything below us and could see we were not the only hikers making a dash for refuge Fond des Fours. We reached shelter just before it began to pour and gratefully spent the afternoon reading and drinking beer as the storm raged outside. 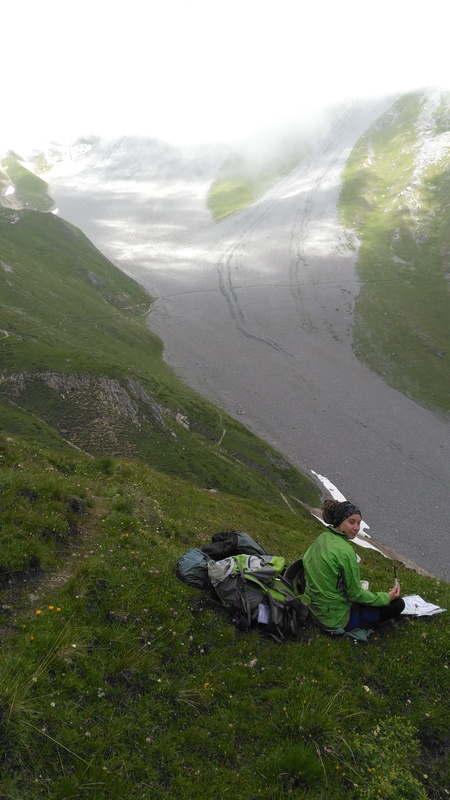 When it cleared we put up our tent in an alpine meadow which was home to many marmotte friends. We had decided to have a kind of rest day at Fond des Fours and woke late the following day, had a leisurely breakfast (and many cups of tea), read our books and then headed up the valley to explore. It was lovely traveling so light and without packs. Our walk took us nearly to another pass and we were again surrounded by stunning beauty. There was a particularly high snow covered mountain range to our left and we thought we could just make out mount blanc. It stormed during the night, lightening lit up the whole valley and momentarily I was a little scared. The morning however bought blue skies and the night’s rough weather was soon forgotten. We headed down the steep valley, towards the ski resort town of Valdisere. Gradually civilisation encroached on the wild mountains we had been walking through; chair lifts, chalets, horses and then finally the town itself. Trudging through the very slick and shiny streets we felt decidedly out of place. In winter Valdisere is a fancy ski village, and even in summer it appeared to be full of people clad in brand name hiking clothes, looking very fashionable. We did treat ourselves to a vegan lunch in a cafe – not something that is particularly easy to find in this part of France! Just out of town we found a campsite where Astrid’s few words of French seemed to charm the manager. He gave us a super spot to put up our tent and couldn’t have been more helpful. The afternoon brought rain, so we rested, read and tried to study more french. The following morning we basically had baguettes delivered to our campsite – how very French and awesome. We accidentally bought four (have I said Astrid can get a bit over excited?) After a big breakfast it was time to gain the height we had lost once more. Once we left the village it was a steep trek upwards through more pine forest. From forest the landscape changed to open meadows where the winter ski runs had been turned into mountain bike trails. It was impressive to see some of the skills of the riders. Sadly in the afternoon we were introduced to the not so great side of people seeking an escape to the mountains as we came face to face with a hideous ski resort town. Ugly high rises scarred what would have been an idyllic valley. Why do humans seeking nature simultaneously destroy it? How are these mass corporate developments permitted? Why do people need to pollute nature with all their creature comforts? Baguette delivery, only in France! We stayed only to eat lunch by a lake and fill our water bottles. It was a relief to escape and reminded me how when you spend time surrounded by nature and beauty, these kind of places wear on your soul more heavily. We hiked up passed ski lifts and day walkers until we reached the col del la leisse. Surrounded by rocks, ice, tiny wild flowers, lakes and peaks my heart once again filled with happiness. It was a long day and we reached refuge de la Leisse quite late. There was a lovely spot to put our tent and some very cute chickens. Again it had been rough over night weather wise but we woke to only clouds, no rain. The descent to the valley floor was so peaceful. Not many hikers around, just the sheer power of the mountains and a few ibex. I spent some time just sitting on a rock while I waited for Astrid, taking it all in. Life makes sense out here. There is something incredible about being surrounded by such wild beauty. I probably could have sat there all day. Eventually we came to a 16th century bridge where we had to make a decision about our route. Either head into a valley to explore it, or towards a glacier. We opted for the glacier. From the bridge we climbed another pass and were rewarded with a school group at the top. Fortunately also a lot of ibex. Once the school group had left Astrid and I stayed and watched the Ibex for a long time. We really love them and even came across some very adorable baby ibex. After passing through a rocky valley and by a beautiful alpine lake we reached the very popular refuge col del a vanoise. It does afford some fabulous views but we didn’t fancy the crowds, or the lack of camping. The descent was superb and I spent a lot of time looking back at the amazing views. I reached refuge Barnette a little before Astrid – it was right at the top of the ski lift and had a wonderful balcony and superb views. Views that were better enjoyed with an ice cold beer. It was hot and sunny and the beers went down a treat. Later we put up our tent and cooked our simple meal while the more fancy hikers (waiting to be served their meal) looked on. I feel like we must have looked very weird to them. We enjoyed a lovely sunset and went to bed with clear skies above. I would never have guessed that a ferocious storm would hit in the early hours of the morning. A reminder about the unpredictability of mountain weather. Luckily we only had to repitch the sides which were ripped out by the wind. Our trusty tent held fast and we stayed dry and cosy until it had eased enough to get up and pack up. Another hiker David had not fared as well, having to re pitch his tent in the storm. David was from NZ and the first native english speaker that we had met so it was quite exciting to talk to him! Once the rain had eased a little, we packed up, revived the stove (which we had accidentally left out), made some breakfast and tea and headed down towards Pralognan, the village at the foot of the ski lift. Although it intermittently rained, the walk down was lovely and we were often sheltered by the trees. Pralognan is thankfully hemmed in by forest and mountains, making ludicrous development more difficult. Predictably we headed strait to the supermarket and to our joy even found peanut butter, which is not always common in France and a vegan’s best friend. Even the hummus here has been hijacked by sneaky cheese. Baguette baby. Trying to keep the fresh baguette warm! The rain had really set it so we decided to call it a day and headed to the municipal campsite on the edge of town. In the afternoon David arrived and we spent a lovely evening chatting in the small shelter while Astrid and I polished off a bottle of wine. Rain delayed our start again but we were determined to get out of town and back into the mountains. By 9.30am we were walking through pine forest and along a fast flowing river. The rain came and went, I even put on my waterproof trousers at one point! After an hour or so we were back in the park, our path leading gently upwards, passed the odd alpine farm. As the mountains neared we began to see that the peaks had a dusting of snow. A final steep push and we reached the lovely hut of Peclet Polcet. It was one of the few huts we couldn’t camp at and we had taken a gamble by not booking. Luckily some beds were still available (they will never actually turn hikers away, you just might have to sleep in a room on the floor). We cooked some lunch and settled in for an afternoon of writing. I had the worst night sleep of the entire trip in the dorm at Peclet Polcet. A room full of snoring middle aged French people combined with the rising heat of 25 bodies and the almost constant slamming of doors. Over the years I’ve slept in loads of dorms and it’s usually fine. Perhaps I was just having a bad night, but I can’t believe people would choose dorms over camping! After breakfast we headed up towards the pass. It wasn’t long till we were walking amongst snow covered rocks. The wind chill was epic – sub zero and the clouds moved constantly above us. The going at first was easy, along a path defined by cairns. However, as we climbed higher it became mildly terrifying. Being early in the day, there were barley any foot prints to guide us and the track was covered in snow and ice and quite slippery. Not to mention being blasted by an icy wind. Soon I was using my hands to stop myself from falling, trying not to look down. Finally we reached the pass but it was so cold and windy we had to descend almost straight away. The brief view we had into the next valley was spectacular, as was the blue sky ahead. The decent was also marred by ice and snow and freezing winds, but not as scary. We literally couldn’t stop due to the cold until we were well beyond the snow line and able to shelter behind some rocks. Even then it was freezing and we piled on more clothes and snacked quickly on a trek bar. We continued down, layered to the max, while the people coming up in t shirts gave us weird looks. Soon the smell of pine was upon us and the sun began to have some warmth to it. We were out of the desert like landscape of the high mountains and back into the summer. All around us was green and blue and the sound of insects buzzing. We hiked into forest and through lush meadows passing by tiny alpine hamlets. Soon we could see Modane down in the valley below. The temperature steadily rose and by the time we reached the town, it was over 20 degrees. Hard to believe we’d been freezing on top of a pass only hours before. Back in Modane we headed to the supermarket, then a camp ground on the edge of town. We relaxed in the afternnoon sun and drank some cold beers, a perfect way to finish our 14 day hike. 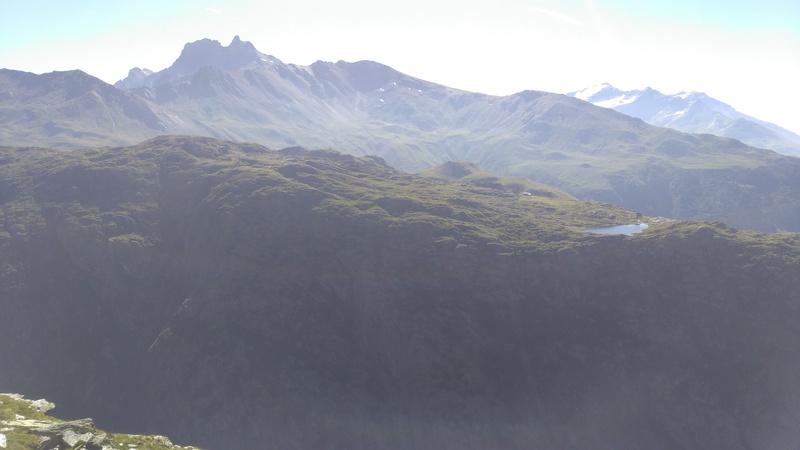 The Vanoise had been exactly what I had hoped for – a stunning and varied alpine environment that had fulfilled all my childhood fantasies about the alps. For anyone wanting an adventurous hiking holiday, surrounded by amazing mountains that doesn’t break the bank, I would definitely recommend jumping on a train to the alps with a tent, some supplies and a sense of wonder.